Mountain bikers now have another wheel choice for their quiver - the 650B. Kirk Pacenti showed a 650B mountain frame at the NAHBS event earlier this year and the buzz was immediate. Larger wheel sizes roll over obstacles more easily and like to maintain speed. The 650B wheel size measures ~27.5" placing it between the standard 26" and ever popular 29" wheel sizes. Although the 650 wheel size has been popular for many years on touring bikes, it's now making it's way into the mountain bike realm. I'm very excited at this new development and prototype frames are in the works from Ahrens Bicycles. Click on link below and vote for 650! 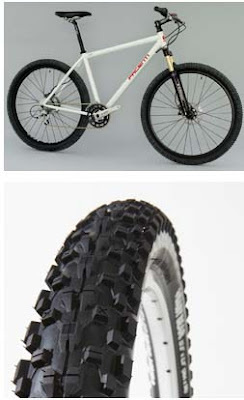 Here are pics of the Pacenti prototype with a White Brothers fork and his own Neo Moto 2.3" tire. Tire and rim selection continue to increase and by next spring there should be a nice variety of 650B wheel/tire components from Velocity, Sun, Panaracer and Kenda.